I adapted this recipe from one I found at Whole Foods. It is a great go-to meal that takes no time and is really delicious. Lima beans give it the extra protein punch. p.s. I use frozen lima beans. I have tried several times to soak and cook fresh lima beans but I haven’t had any success. Chop the onion and sauté in olive oil on medium heat. When they are translucent, add the rice and stir to coat with the oil. Drop in the saffron strands and stir. Add the tomato sauce, peppers, lima beans, broth and water. Bring to a boil and then reduce to a simmer. Cover and cook for about 10 minutes. Stir in the peas.When all of the liquid is absorbed, the paella is ready! 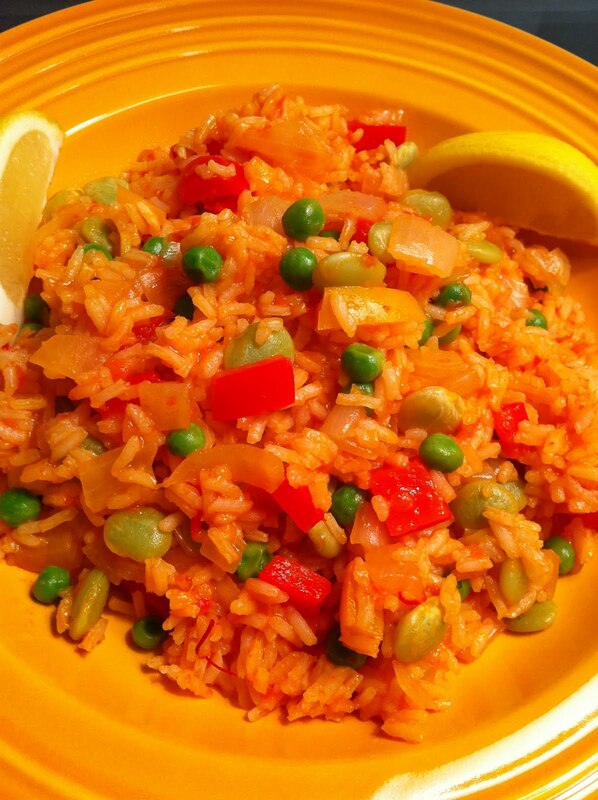 Right before you serve, squeeze 1/2 of the lemon over the paella and mix. Serve with lemon wedges for (a) garnish and (b) for a little extra zing. This paella is even better the next day. Enjoy!